Rhubarb Coffee Cake started from my recipe for Rhubarb Streusel Muffins. Of course cake and muffins are technically different but for my everyday style of cooking I like a versatile muffin recipe that can be baked as a cake when the occasion calls for it. Nothing fancy, just a cake cut into squares. The British version of coffee cake was originally flavoured with coffee but that is no longer a requirement. North American coffee cake is more typically a single-layer cake flavoured with cinnamon and possibly fruit, said to be served with coffee. I gobbled up tons of my mom’s coffee cake when I was a kid so I assure you it does not need to be eaten with coffee either. According to my mother sour cream is a necessary ingredient to activate the baking soda and make a tender coffee cake. Her coffee cake always had sugary-cinnamon crumbles on top too, also known as a streusel topping. So for me this sweet topping is absolutely essential for coffee cake. I have a beautiful rhubarb patch in my garden but I never pick all of it. I love the look of its’ giant green leaves that grow all summer long and the way the sun shines through them at different times of the day. Rhubarb is often free for the taking in gardens and alleys nearby. Home cooks love making the usual rhubarb pie, jam, crisp and cobbler but some go beyond making everything from barbecue sauce to sangria. Every year I pick some rhubarb and make my Rhubarb Streusel Muffins. Less often I make a Rhubarb-Raspberry Pie or Rhubarb Strawberry Crisp. That’s about it for me and my rhubarb. Inspired by my rhubarb patch I wanted to attempt my muffin recipe in cake form. If you are new to gluten free baking muffins is easy, it really is the best place to start because you can be successful quickly. Cake on the other hand presents a few challenges. All baked goods require ingredients to create structure. The purpose is to make a muffin that can stay together or a cake that holds its’ shape. In gluten free baking we need to create structure without gluten. As I baked more I learned more and started to notice these finer points such as structure. In my experience adjusting my homemade flour mix to include potato starch and millet flour improved the structure of my baked goods. I kept learning and discovered that adding an extra egg or egg yolk also improves structure. In this recipe I also increased the xanthan gum for good measure. As I have been writing my monthly blog post series on How To Use Gluten Free Flour I have learned a lot about baking so I know you can too. To me the goal of baking at home is to be able to successfully bake the foods you love. I turned my everyday Rhubarb Streusel Muffin recipe into this Rhubarb Coffee Cake and really, it was a piece of cake. Even people baking with wheat flour struggle with baking. Every oven is different and even standard baking pans vary a bit. Then there is the oven temperature and many more factors that challenge us everyday home cooks. Where you can improve is to be precise when you measure ingredients and use proper bakeware. My advice is to buy quality pans since they will likely last you for more years than you can imagine. Here are three choices of modern baking pans that will yield great results. I always recommend buying them in pairs. This is most efficient when doubling recipes to feed a crowd so you don’t have to wait for a pan to cool then make the recipe all over again. It is also helpful when you want to make a layer cake like “that Quinoa Chocolate Cake“. 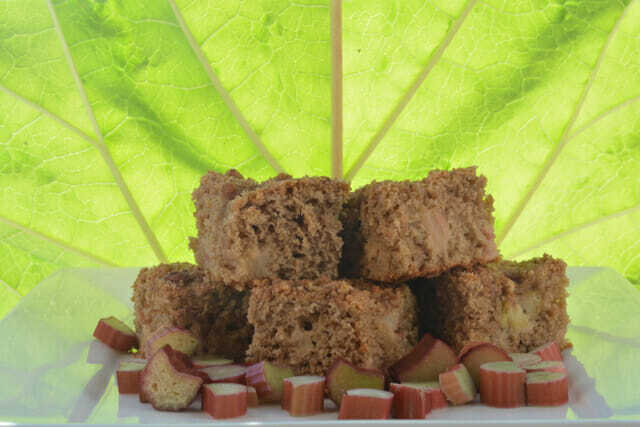 Let me know in the comments below if you made this Rhubarb Coffee Cake or what else you are baking in your kitchen these days. In a small bowl combine sugar, walnuts, flour, cinnamon, butter, zest and cinnamon. Stir with a fork until well combined. Set aside. Preheat oven to 350°F. Grease an 8-inch square baking pan. Set aside. In a large bowl combine flour, rhubarb, sugar, baking soda, xanthan gum, cinnamon and salt. Stir until evenly combined. Spoon batter into prepared baking pan. Sprinkle streusel topping evenly over the batter. Bake in preheated oven for 30 minutes until nicely browned. *I have also made this substituting ⅓ cup of GF flour mix with ⅓ cup of oat flour, buckwheat flour and teff flour.